Yes, I'm remixing lines from Dylan Thomas' "Do not go gentle into that good night", but only because game reviewers' mixed reactions to id Software's Rage have my head spinning. From the creators of Doom and Quake comes a whole new game with shooting and a one word title, only this time instead of fighting hellish interdimensional beings we're fighting ourselves. Or rather we're fighting what's become of ourselves that were left outside the people-preserving arks set up to save humanity from an asteroid apocalypse. Why can't we have a nice post-apocalypse, where everyone gets together and graciously rebuilds the planet? Probably because no one can agree on how good or bad Rage is. Lightning-forking words coming right up. RAGE isn't what you think it is. In fact, it's easiest to tell you what RAGE isn't right away. It's nothing like Fallout 3. It's nothing like Borderlands. It's not an RPG, though Id and Bethesda have used RPG terminology in describing it. It's not much of an open world. It's not very big. It's not very long. And unfortunately, it's not the return to prominence that Id fans have been hoping for. ...how does Rage, the newest triple A release from id compare when stacked up against rival high-fliers in the FPS genre? In a word, "weirdly". Rage looks the part and it plays very well, but it's littered with kinks and quirks that may strike contemporary shooter players as, at best, odd and at worst, horribly out of date. Why, for example, is there no checkpoint system? Why can't players pick up the weapons of their victims when they can loot their bodies? Why, given id Software's legacy with regards to the online deathmatch is there no competitive shooter multiplayer mode? And who thought it was a good idea to place the biggest and best boss battles in the middle of the storyline? The group of NPCs that eventually turn out to be plot-essential allies wind up being the most dull, predictable personalities in the game, and no compelling villain ever really emerges. Instead you fight pockets of bandits, crazed mutants and the relatively faceless Authority. They're fun to shoot at, but no significant contextual drama is ever established over the course of Rage's roughly 10 to twelve hour run. The story is propelled by a series of short-term goals that gradually reveal bits of the overall tale and it's difficult to get invested in a world populated by characters that, for all the lifelike animations, feel more like court jesters than endearing characters. In its final moments Rage falters significantly, failing to deliver any kind of satisfying conclusion or encounter. You fight a lot of things in Rage, but it never feels like you're fighting for any reason other than your personal entertainment. The main multiplayer component is buggy-based racing and combat for up to four players. This seems surprising coming from a developer like id, but it's given the same care to the vehicle shenanigans as it would have to a more rote shooter suite. There are three primary game types with one asking you to collect falling asteroids and deliver them to moving zones, and another that tasks you with being the first to three consecutive checkpoints to score. You also get the typical deathmatch, and thanks to the ability to upgrade your buggy with new parts and powerups as you gain levels, there's more than enough motivation to return that what can best be described as a gritty Mario Kart. 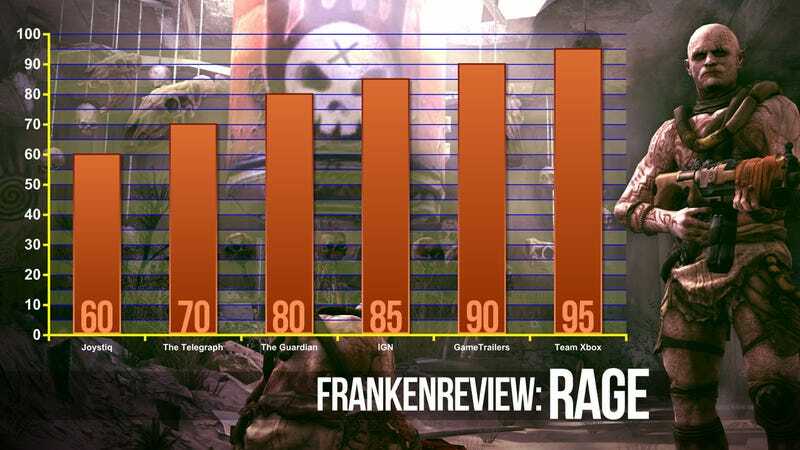 So to close out this review of RAGE: While the game doesn't necessarily introduce any kind of ground-breaking gameplay elements, what it does is perform some tried-and-true FPS staples (and some newer concepts too) at a very high level, and hits the mark an overwhelming majority of the time. I am happy to have this game in my collection, and believe that shooter fans the world over would be derelict in their responsibilities as gamers to not give this one a try. It is simply a fun game to play. I had a blast with it, and I hope you do the same as well. I'm not sure if I should rage against Rage, or if it's all the rage. Also, rage.